3 Piece Set is available including 2 bar stools. 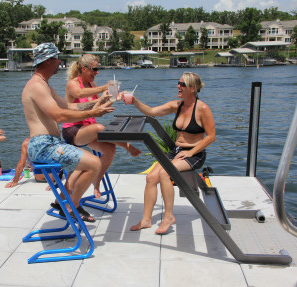 This innovative product manufactured by WetSteps is a 2 position dock / swim up bar providing the perfect gathering place when in the upright position, or when your party heats up, lower the Swim-Up Bar into the water to offer plenty of cool seats for everyone. Hang out on your dock and enjoy cocktails with friends. Its a bar!! Foam inserts included to hold your drinks and soften your seat. When lowering bar into the water, removethe inserts and use for floatation for swimming.